Learn from others’ mistakes: Don’t Wrangle Yeast Naked. 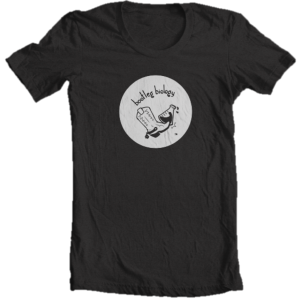 Clothe yourself in a 100% cotton, pre-shrunk, charcoal gray, yeast-friendly, Bootleg Biology Logo T-Shirt. Please contact us for shipping rates outside of the U.S., Canada & Australia. Orders will ship 1st Class USPS the next business day after ordering in most cases. Per USPS, U.S. delivery is estimated 2-3 businesses days (AK/HI 4 biz days) after shipping.